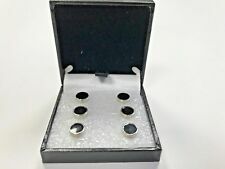 A classic black and silver style set of dress shirt studs. The stud fits onto the buttonhole on the front of a pleated shirt. A nice way to add style to a suit, simple but effective. Presented in velvet gift bag. Protractor Cufflinks. Great novelty gift for a teacher, engineer or architect. Size - Cufflink 20mm x 10mm. 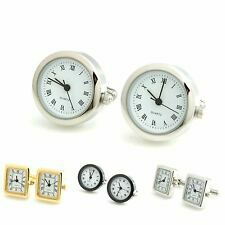 SILVER CUFFLINKS and TIE CLIP SET. Size - Tie Clip 5.3mm x 5mm. PAIR OF SPITFIRE CUFFLINKS. Presented in velvet gift bag. Weight - 12g. High quality stainless steel has high resistance to rust, corrosion and tarnishing, which requires minimal maintenance. Shape\pattern: Oval. Material: Stainless Steel. Main Color: Silver. 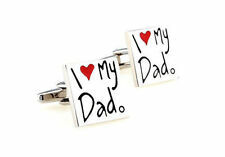 PAIR OF GEARSTICK CUFFLINKS. Material - Silver coloured Stainless Steel. Presented in velvet gift bag. 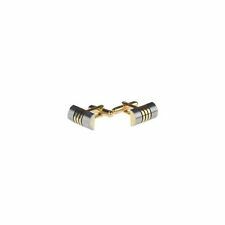 Size - Cufflink 20mm x 10mm. 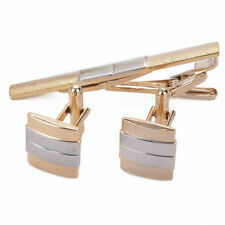 GOLD CUFFLINKS and TIE CLIP SET. Size - Tie Clip 5.8mm x 5mm. UK BLACK STUNNING VENETIAN MASQUERADE EYE MASK HALLOWEEN PARTY LACE FANCY DRESS. Double Star 316L Prong set nose Eyebrow Ear HORSESHOE Ring Bars body Piercing. Stainless steel material. Black Jesus Cross design. After Placing order you will receive an automatic email within 2 - 3 Hours, How to Send your PHOTO ALONG WITH YOUR EBAY USER NAME. AUTHENTICATED CUFF LINKS EACH ENGRAVED"Germany". 1 set of cufflinks with fabric 1.5cm buttons. 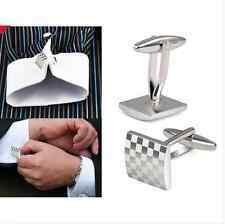 Mens Stainless Steel Business Shirt Silver Square Lattice Wedding Cuffls. 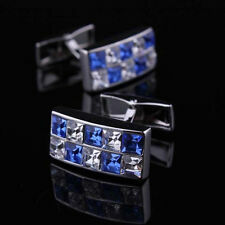 100% New and high quality Gorgeous and shining silver cuffls for men Very classical and delicate, an eye-catching one! Great for special and important occasions Ideal gift for boys and men Material: stainless steel Color: silver Size: approx .1.5 x 2cm/0.6" x 0. Stunning set of Rose Gold Cartier Cufflinks Amazing detailed finish. Perfect for complimenting any suit. Whether it is a Work Function, Wedding or a Dinner. If you need any more details then please do not hesitate in messaging me. Ill happily help to the best of my ability. Postage is 1st class Recorded/Signed If you are not happy with your purchase I will offer, within reason, a hassle free refund. Thank you for your custom. Custom Personalised ABC Initial Alphabet Silver Letter Cufflinks Mix & Match!